Social media is filled with lots and lots of content and most of it is unstructured data, meaning that it doesn’t fit into databases or rows and columns on a spreadsheet. In particular, lots of text, images, video and audio content is posted daily. 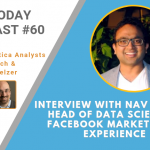 In this podcast, Cognilytica analysts Kathleen Walch and Ronald Schmelzer interview Nav Kesher, Head of Data Sciences, Facebook Marketplace Experience on his insights and experience on AI and its various applications in different industries.